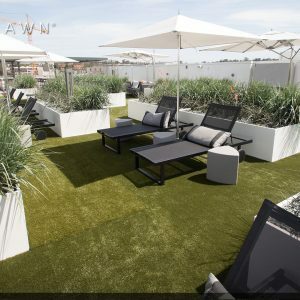 Benefits of Artificial Grass for Commercial Properties | Turf Etc. Kansas City business owners and commercial property managers should not underestimate the value of realistic artificial grass. In recent years, business owners have looked for time and money saving solutions. Fortunately, artificial grass installation offers both. The team at SYNLawn Kansas City installs custom landscape designs and unique design elements using artificial grass. Learn more about the different applications available to commercial locations and the many benefits that come along with installation. Commercial properties are different than residential homes, so our team has learned to adapt to different styles and different needs of business owners. We offer many types of applications that can be used indoors and out. Our custom landscape designs add a unique twist to your business, not to mention lush, green grass all year long without watering or mowing on your part. Community parks, daycares and schools can benefit from realistic artificial grass installations as well. Our playground systems have been thoroughly tested and certified by the International Play Equipment Manufacturers Association (IPEMA) with signifies that our turf is safe for children to play on. The surface is non-abrasive and can protect children from falls as high as 10-feel. Many of our products can be installed indoors, but some of our most popular indoor systems are our practice putting green systems. We offer multiple portable putting greens that can be laid on any flat surface. The revolutionary Dave Pelz GreenMaker™ can be assembled without using tools in under 45 minutes. Simply connect the tiles on any flat surface, roll your turf out over the base and you’re ready to enjoy your putting green. Our portable golf mats are perfect for offices that want to build office comradery. Our practice putting green mats can be rolled out indoors and out. We never know what kind of weather we’re going to get in Kansas City, so it can be difficult to maintain natural lawns. Keeping up with watering, seeding and weeding can be extremely difficult, especially for busy people running a business or maintaining commercial properties. New artificial grass installations can completely eliminate the need to water, mow and weed the lawn around your business. This will save you time and pay for itself in the long run because it will lower your monthly water bill. Realistic artificial grass can be installed almost anywhere and offers a low maintenance alternative to natural sod. It’s also the perfect match for most commercial properties. Our high quality, durable artificial grass can withstand heavy foot traffic without coming loose or losing its shape. This can come in handy for businesses that see a large number of customers every day. Artificial grass also keeps its shape and color all year long, which adds value to your property and boosts your curb appeal. You can attract more people with an inviting storefront! Commercial properties have many options when it comes to artificial grass applications. Our team will visit your space before the design process begins to learn more about your business and its needs. Contact us today to request your free estimate and transform your commercial property!